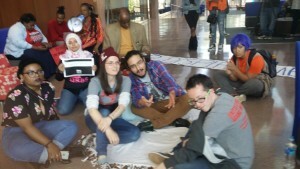 (APN) ATLANTA — On Monday, April 10, 2017, a five hour sit-in by Georgia State University (GSU) students, including members of United Students Against Sweatshops (USAS); and members of the Turner Field Benefits Coalition, which sought to demand a meeting with GSU President Dr. Mark Becker, ended with five people being arrested for refusing to leave the building. 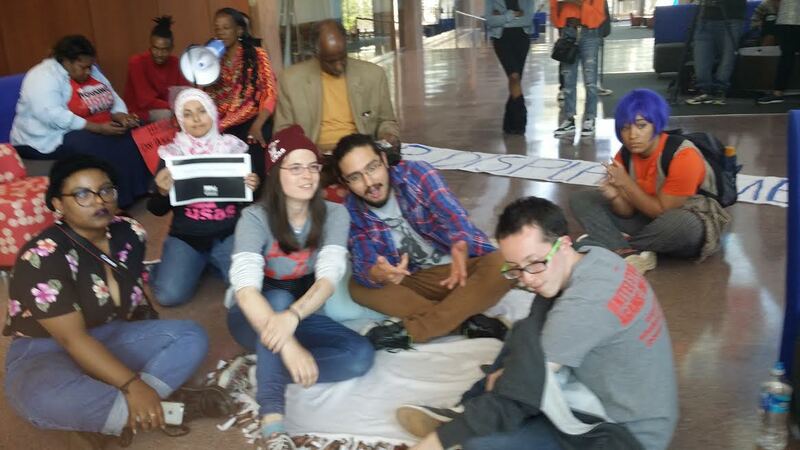 The four GSU students arrested are Patricio Cambias, Asma Elhuni, Samuel Hogan, and Lindsay Wilson. Former State Rep. Douglas Dean (D-Atlanta) was also arrested. They were taken to Fulton County jail around 9 p.m., and posted bond today, April 11. The group, which initially included fifty-plus students and members from the Coalition, has been trying unsuccessfully for months to get a meeting with Dr. Becker. They planned to sit in the lobby of Centennial Hall until they were given a meeting date. They are asking for a meeting with Dr. Becker to negotiate a legally binding Community Benefits Agreement (CBA) for the neighborhoods surrounding Turner Field. They were told that Dr. Becker was in a meeting until 6 p.m., so they waited. However, when that time arrived, they were told that Dr. Becker was not on campus and was not coming back. The students questioned Andrea Jones, Associate Vice President for Public Relations and Marketing Communication, as to why they can’t get a meeting with Dr. Becker. “The University has said that if the meeting is to negotiate the terms of a CBA, the University is not going to sign a CBA, and we will not have a meeting to negotiate the terms of a CBA,” Jones answered. “The University offered to meet with the students but they said no to the terms of the meeting and that’s the last interaction we have had with the students, other than the protests,” Jones said. “The University position is that it does not want to be held accountable for its promises to not displace residents. Yet it won’t sign a legally binding agreement to ensure that happens. So basically, the University position is it does not want to be held accountable for its promises,” Asma Elhuni, a graduate student at GSU, responded. “Dr. Becker explained to the Signal [student newspaper] that there are two community groups that have been working with the neighborhoods and that the neighborhood leadership that has been elected by the….” Jones started to say, but was interrupted as several people all spoke at once. “That community group Dr. Becker is working with is six people and the Coalition is forty organizations,” someone said. “I’m not going to get into this back and forth with you guys,” Jones replied and left. Twenty students and advocates had remained at the sit in and around 7 p.m. requested to be allowed to have food brought in the building. “The building is closed and no one and no food is coming into the building. The building is officially closed and the cleaning crew can not do their job until everyone leaves,” a GSU officer Turner told the remaining students. “I have lived in Peoplestown community for 25 years and I have seen major development that did not benefit us. Over the years we have 60,000 residents and businesses that have been displaced through the Interstates and three different stadiums,” Sherise Brown, a member of the Coalition, said. The Turner Field area was once a thriving Black community with grocery stores, libraries, small businesses, schools, and homes, but now it is a sea of parking lots that cause flooding for residents downhill. Now that Turner Field has been sold, GSU sees opportunities for gentrification. “When we look at this wave of gentrification and displacement, we recognize that these are predominantly White-led institutions with White resources entering Black communities and Black land, and doing what they choose without the residents involved,” Avery Jackson, a student from Morehouse College explained. Students expressed concern that Georgia State has become a commuter school because students cannot afford to live close to the University because there is so little affordable housing. “The city is changing and it’s not for Black people anymore, or people who are not rich… because of gentrification the city is going to become a majority White city,” Patricio Cambias, a member of USAS, predicted. Wait is that the same Douglas Dean the Summerhill Neighborhood Development Corp. sued alleging he secretly pledged the nonprofit’s property to back $2.4 million in bank loans — now in default — to benefit a private developer. The non-profit, according to the suit, “now faces the very real possibility of losing substantially all of its real property assets.” It asks that a judge declare the real estate to be Summerhill’s, free and clear of any other claim, plus punitive damages from Dean and other defendants. In addition, federal tax records list $470,000 in unsecured, interest-free loans from the non-profit to Dean and his wife, and $50,000 to the group’s new CEO. Summerhill reported the loans as “excess benefit transactions,” a term the IRS uses when a tax-exempt filer has paid someone more than it should. A non-profit must pay income tax on the money unless it can recover the loss. Summerhill already had a problem with its property taxes, which Fulton County says have not been paid for three years. The total bill is nearly $56,000. Sad the Pittsburgh neighborhood now has this guy in charge, YIKES!!! No wonder the actual residents and neighborhood leaders jumped ship from the Turner Field Coalition with these kind of corrupt leaders who have now tried to overtake the talks with GSU and Carter.